Graduating from the Basque Country University, Bilbao, Spain, in 1982, Alvaro Urbano-Ispizua trained in Hematology in the Postgraduate School of Hematology of Hospital Clinic of Barcelona (HCP), where in 1988 he achieved a staff post. From July 1989 to July 1990 he stayed at the Institute of Cancer Research of the University of London, analysing the role of RAS mutations and BCR/ABL oncogene in haematological diseases. During 14 years was a staff member of the Haematology Department of the HCP, being the head of the “Research Unit of Cell Therapy and Stem Cell Transplantation”. This unit is one of the pioneers of BMT in Europe. 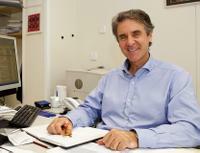 In 2007 he moved to Sevilla to lead the Department of Hematology of Hospital Virgen del Rocío. He is currently Director of the Institute of Hematology and Oncology of HCP and Full Professor of Medicine at the University of Barcelona. He is author or co-author of more than 180 articles with a Hirsch Index of 32 and more than 2400 citations. Journals in which he has published original articles include Lancet, Blood, Journal of Clinical Oncology, British Journal of Haematology, Cancer Research, Experimental Haematology, Leukaemia, Haematologica, and Bone Marrow Transplantation. Dr Urbano-Ispizua serves on the editorial board of several top journals of his specialty. His contribution to the bone marrow transplant field in Spain has been recognized by means of an official and personal communicate by the Ministry of Health, Prof. B. Soria, in 2009. He has been the General Secretary of the European Bone Marrow Transplant Group (EBMT) between 1998-2004 and the President of the Joint Accreditation Committee of EBMT and ISHAGE until October 2006. He has been private consultant of the European Commission, and has formed part of the Official panel of experts of the European Medicine Agency (EMEA).